Many people associate bonsai with Mr. Miyagi’s meticulous pruning in the‘80s classic, “The Karate Kid” or perceive it as an anachronistic hobby. However, contemporary bonsai artisans and fans offer a different perspective on its relevance in today’s society. The art of bonsai-- both the cultivation and care-- requires an investment of patience and time, the antithesis of our technologically driven culture of instant gratification. In fact, it’s not uncommon for a large bonsai to take more than 4 years to reach its first milestone as a refined bonsai. At its essence, bonsai offers a reminder of the beauty of time, connecting us to nature and the world around us, and recognizing the role our native landscape takes in shaping our identity. In straightforward terms, bonsai is the horticultural practice of reducing the rate at which a plant grows, by cultivating it in a shallow container. Artistically, it’s the practice of recreating nature in miniature. To Ryan Neil, founder of Bonsai Mirai, a bonsai incubator, nursery and educational facility, bonsai is the most dynamic art form present today; a media that continually grows and changes, walking the line between life and death. Neil started Bonsai Mirai in 2010 with his wife Chelsea, and the two have been instrumental in introducing bonsai to American audiences and nurturing the art by cultivating and curating bonsai for both casual fans and serious art collectors whose trees sit alongside works by Andy Warhol. Ryan Neil got his official start while studying horticulture at Cal Poly, San Luis Obispo where he met several influential bonsai experts including Ben Oki, the first apprentice to the “Father of American Bonsai,” John Naka. Under Ben’s tutelage, Neil was introduced to Masahiko Kimura under whom he would eventually apprentice in Japan for the next six years. While studying under Mr. Kimura, Neil began to identify the potential to bring American style to the art of bonsai, utilizing the vast resources of the Western United States along with diverse landscapes for creative inspiration. While technically any type of tree or shrub can be trained as a bonsai, Neil prefers to work with Rocky Mountain Juniper and Ponderosa Pine which are inherently American due to their indigenous origins. First, the initial styling, where the major structure of the tree is decided and set into place. 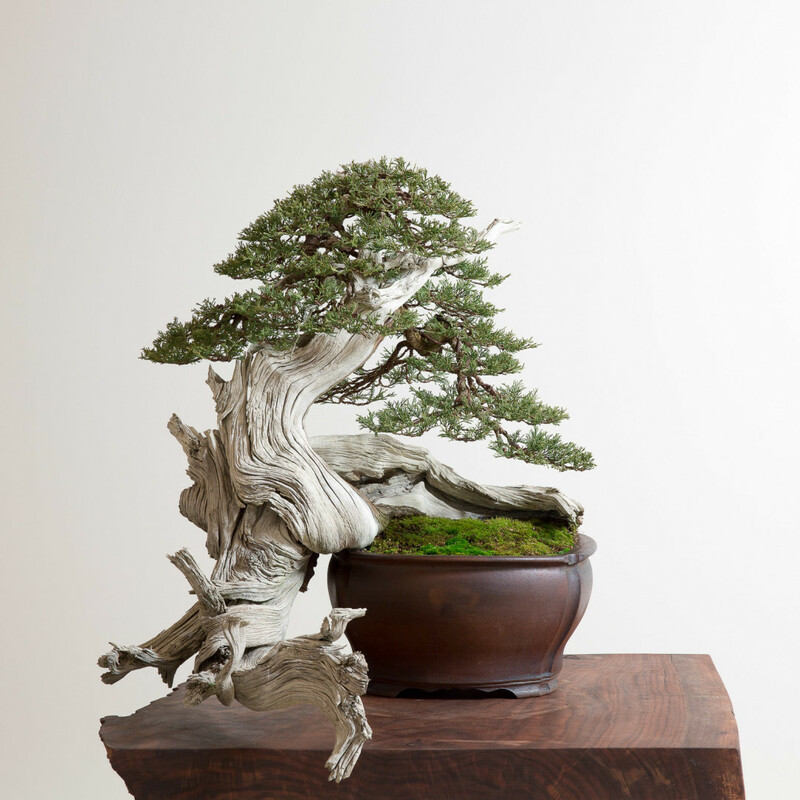 He aims to bring attention to American Bonsai and inspire a new generation of enthusiasts with The Artisans Cup, an American Bonsai exhibition and competition which takes place at the Portland Art Museum, September 25-27. “Portland felt like the perfect place to host this event, given not only the strong support by the Pacific Northwest bonsai community but also because the city is widely recognized for playing a pivotal role in revitalizing artisan movements,” says Chelsea Neil. Ryan says, “For this event, our goal was to create a platform to showcase a new expression of this age-old art form.” The duo plan to bring the exhibition to major art institutions across the U.S. as well as internationally. Their labor of love has evolved over time, but just like bonsai, the work is never actually finished.